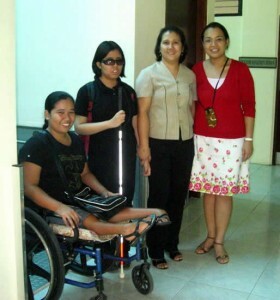 Returning PWD scholars led the screening of 14 hopefuls for school year 2011-2012 last June 25, 2010 hosted by NCDA. AFS Philippines Program Manager Miss Tisha Lee Eduave, in tandem with NCDA Project Evaluation Officer Fatima Garon, gave returnees Carla dela Cruz (batch 1) and Maria Adisa Nahil (batch 3) full backup as interview panelists. Qualified contenders will live with foster parents and study under the AFS exchange student program for one year in America. The screening happened in 2 parts, 1st, the panel interview of individual applicants, followed by a cultural talent show by groups. For this, the students were divided into 2 teams. Team A composed of 9 deaf students gave a presentation depicting the Filipinosâ€™ religiousâ€™ customs, Team B made up of 4 visually impaired and 1 Cerebral Palsied student, gave a song rendition. Since the opening of the program in 2004, AFS Philippines has sent 11 scholars with disabilities who left impressive marks in their various school placements in the US. For this school year 2010-2011, three scholars are set to leave the country for the school opening this fall. They are Jeremiah Bartolome, Jennessey Empang and Mark Kevin Carandang. results for the yes program?? I am so glad to hear that AFS has launced a program to include students with disabilities. 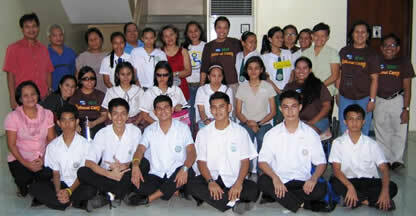 I am from the AFS 8th batch and very much into promoting inclusive education in the Philippines. I have a founded a school in San Juan City that includes children with special needs in a welcoming and caring community providing them access and quality education. I will be happy to provide a tour of our small school to Ms. Pelaez and Ms Guerra to see inclusive education in action. meron n po bng SPED s mga public school here in GMA.thanks!